Clinic Director Dr. Rob Gruttadauria, DPT, OCS, has worked with Performance Physical Therapy since 2012 as a student, and is now a physical therapist and clinic director at our Providence location and a partner at Performance. He received a bachelor’s degree in Kinesiology and a Doctorate of Physical Therapy from the University of Rhode Island. After graduation, Dr. Gruttadauria became a board-certified Orthopedic Clinical Specialist, an Evidence in Motion instructor, and a member of the American Physical Therapy Association. He’s also earned a certification in functional dry needling. Dr. Gruttadauria specializes in Functional Movement Screening and the Selective Functional Movement Assessment, in orthopedic, post-surgical, and sports rehabilitation, and working with patients on fitness, nutrition, and wellness. He’s hosted monthly injury workshops with Rhode Runner, and developed partnerships with Method Fitness, Core, Olympia Fitness, Orange Theory Fitness, and was a diabetes class instructor with Coastal Medical. Lostritto specializes in general and post-surgical orthopedics, manual therapy, balance, functional dry needling. She also completed Performance Physical Therapy's in-house hand residency program, giving her additional expertise in treating hand and wrist injuries. She's also a member of the American Physical Therapy Association. Angela is originally from Johnston, RI and attended undergrad close to home at Providence College, where she received degrees in Biology and Spanish. With a degree in Spanish and her Portuguese heritage, Angela has developed a proficiency in these languages that has helped to improve patient/caregiver dialogue. After graduating from Providence College, Angela moved to Boston where she attended Northeastern University for her Doctorate in Physical Therapy. While at Northeastern, Angela traveled to Switzerland where she participated in an oncology rehabilitation course and learned about the practice of physical therapy internationally. Dr. Hailey Shore, PT, DPT, has worked with Performance Physical Therapy since 2016 as a physical therapist. She received an undergraduate degree in Kinesiology and Exercise Science from James Madison University and a Doctorate of Physical Therapy from the University of Rhode Island. She is a member of the American Physical Therapy Association. Dr. 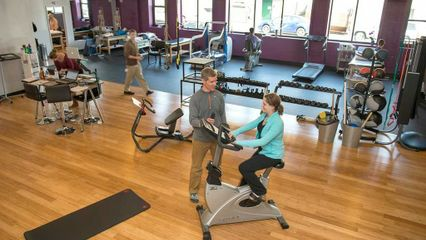 Shore specializes in general and post-surgical orthopedic rehabilitation, core stabilization, postural correction, balance and gait training, manual therapy and vestibular rehabilitation. She is also certified in functional Dry Needling. In the past, Dr. Shore has volunteered at the RI Special Olympics, as well as at the Centro de Mayo in San Juan La Laguna in Guatemala, where she traveled to provide physical therapy services. Dr. Kyle LoPresti, PT, DPT, has worked with Performance Physical Therapy since 2017 as a physical therapist at our Providence location. After earning a bachelor’s degree in Exercise Science, he went on to earn his Doctorate of Physical Therapy, both from the University of Rhode Island. Dr. LoPresti has expertise in treating orthopedic issues and he also regularly works at the Rhode Island Hospital’s inpatient rehabilitation unit. Dr. Patrick Motel, DPT, joined Performance’s Providence Location in 2018. Dr. Motel has a BS in Health Science from Lock Haven University and A Doctorate of Physical Therapy from the University of Rhode Island. Since graduating in 2017, Dr. Motel has gone on to achieve certifications in SFMA level 1, TPI level 1, and Personalized Blood Flow Restriction by Owen’s recovery science. Along with his clinical expertise in Personalized Blood Flow Restriction, SFMA screening, and TPI golf swing analysis, Dr. Motel took an elective class involving time with the Huston Astros, Detroit Tigers, Tampa Bay Lightning, and University of Florida Athletic Department. He also has experience with return to sports rehabilitation training with Isokinetic in Milan, Italy, and volunteer experience with the Renton Park Run free weekly 5k’s. In his free time, Dr. Motel enjoys managing the Bulldog’s Instagram page, traveling, kayaking, playing pickup sports, and cooking. He loves reading and watching the lord of the rings, Boston Celtics, and Pittsburg Penguins. Some health advice he would like to give is to focus on your mental stress because that can manifest physically “some people just need a smoothie and a hug”. Dr. Ross Levine has worked with Performance Physical Therapy since 2016 as a physical therapist at our Providence location. After earning a bachelor’s degree in Exercise Science and Nutrition, Dr. Levine went on to earn his Doctorate of Physical Therapy from Franklin Pierce University. Since graduating he has earned certifications in instrument-assisted soft tissue mobilization and dry needling. Dr. Levine serves on the Performance Physical Therapy Clinical Standards Committee and aims to earn his Sports Physical Therapy certification from Evidence in Motion and a Sports Clinical Specialist certification. He has expertise in orthopedics, sports injuries, balance training, postural correction, and core stabilization. Dr. Katie DeJesus, DPT, has worked with Performance Physical Therapy since 2015 as a physical therapist at our Providence location. After earning her bachelor’s degree from Boston University in 2011, she went on to earn her Doctorate of Physical Therapy in 2013, also from Boston University. Dr. DeJesus has continued her education by becoming manual therapy certified through Evidence in Motion, and she’s earned certification in dry needling and the Graston Technique. She is an American Physical Therapy Association member, and would like to become a certified clinical instructor and orthopedic clinical specialist in the future. Dr. DeJesus specializes in treating general and post-surgical orthopedics, manual therapy and aquatics. She also volunteers with the Special Olympics in North Kingstown, and the state summer games.